I didn’t mean to ignore my blog but I’ve been spending all my spare time driving my kids around Southern California. My husband was in Florida for a couple of days on business and so I had to do all the driving myself. I tallied up all my time behind the wheel today and lost track after adding up five hours of drive time. FIVE HOURS. Driving kids around is a part-time job, the kind of part-time job that costs you money and makes you wonder why you had kids in the first place. It’s like pizza delivery only without the smell of pizza and without any tips. It’s driving for hours and finding yourself back where you started, only minus the gas in your tank. At least the kids are old enough not to kick the back of my seat. And I don’t have to carry a plastic potty chair in the trunk of the car just in case like I used to do when we lived in Michigan a million years ago. 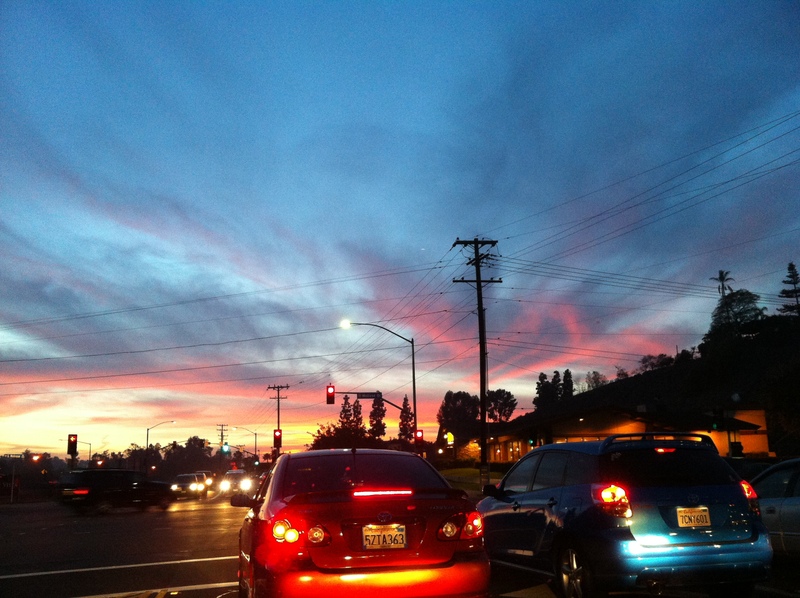 Tonight while I was heading home, pink spread across the sky and I wished I were at the beach snapping photos. The best I could do was a photo taken at a stoplight with my iPhone. 1) I have not been organizing my laundry room. I’m not sure what has happened in there but Martha Stewart would disapprove of the situation involving dryer lint, empty detergent bottles, tangled hangers and stacks of fabric. 2) I have not been reading. I have so many books stacked up and I keep putting a book next to my pillow right before I fall asleep without reading it. 4) I have not been sorting through my office closet and organizing it. When we moved in, I just sort of stacked things in there, intending to tend to it later. Later has come and gone and that closet taunts me. 5) I have not been watching the Olympics except for right now while I am watching the cross-country skiing event where they periodically stop and shoot a gun. I don’t really understand the gun portion of this sport. I usually love watching figure skating but this year I can’t get interested. And all the speed skaters look the same . . . I have no emotional attachment. If I were you I would pay someone to do some of the driving or join a carpool. I have not been doing anything. Except coughing. And hating snow.